Anyone who works with power tools is familiar with the amount of noise they create. 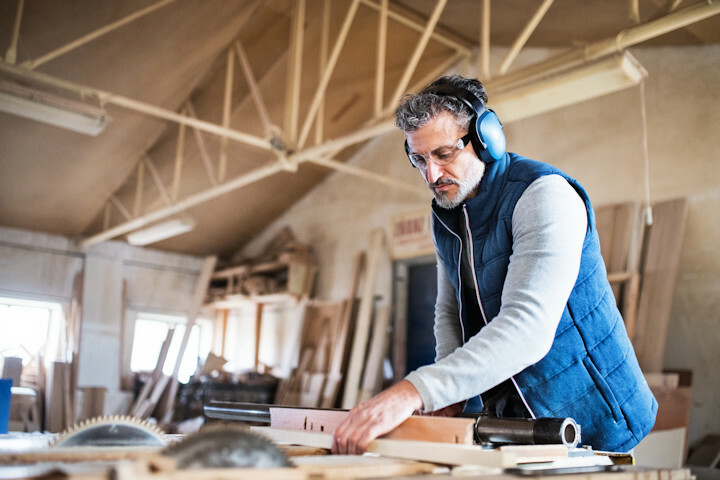 Depending on where you work may determine how much hearing protection you need, whether it’s in an outdoor environment or an interior workshop. Some of these options seem too cautious for some, but in the case of protecting your hearing, it’s always better to be safe than sorry. Wearing headphones can drown out outside noise while keeping you entertained, but if you are listening to music louder than the machines you’re working with, you may be doing more damage than without them. Hearing damage can occur if you’re exposed to 90 decibels for a sustained number of hours, and power tools like a handheld router or benchtop planer have been measured at about 100 decibels. Even if aren’t able to feel the pain in your ears, the effect on your ears can still be damaging for years after. Plugging your ears is not a new option, but this way of protecting your hearing has been used for centuries due to its effectiveness. The most common form of earplugs are those made from soft, moldable foam, which you pinch down to fit inside your ear before putting them in and allowing them to expand. These are usually the cheapest option, however, they are also easy to lose and far more disposable than other options. Earplugs can also be made out of soft rubber, which are easier to clean and more durable. They usually have rubber ridges along the edges to help hold the earplug in place, but they usually keep their same shape in and out of the ear. As a result, they don’t always block out noise as effectively as foam, and they can irritate some people’s ears due to their unyielding shape. Unlike earplugs, earmuffs are generally more expensive, but they also last much longer and are much more difficult to lose. The large differences between headphone and earmuffs are that earmuffs serve to protect your ears and dull the noise around you, while headphones are designed to block out the outside noise in order to play music. The problem with using everyday headphones for manual labor is that, if they don’t effectively block out the outside noise from your workshop, you’ll end up turning up your music more to completely block it out, which may do more harm than good. Whether you choose earmuffs or headphones, be sure that they are effective at blocking outside noise. Check the packaging details or company’s website to see what decibel levels they are designed to block out, and test that for short periods in your workshop prior to committing to one type of ear protection. Some people prefer the feel of earplugs to earmuffs because they are more lightweight and less obtrusive, but if your earmuffs and eye protection don’t bump into each other too much, then you should be fine. The best way to know what works for you is to try out different types. Foam and other forms of earplugs aren’t too expensive, so buying a few for testing will be worth the investment. If you’d rather not purchase a pair of earmuffs to try them, see if you can borrow a pair from a friend for a week. The easiest way to determine which type you’ll enjoy, however, is to see what kind of headphones you prefer. If you keep buying those that go into your ear because you prefer the feel to headphones that rest over your ear, then you will probably prefer some type of earplugs. I use SensGard ZEM Technology Noise Canceling Hearing Protection that I got at Home Depot. It is a type of ear plug, but much harder to lose. it will hang around your neck so it is readily available when you need it. Also blocks noise very well. Good basic info on hearing protection. As a nearly 30-year Environmental, Health, & Safety professional, I’d encourage everyone to do their homework when looking for hearing protection. One of the big keys is their Noise Reduction Rating (NRR). This is the # of decibels the hearing protection will reduce their exposure by when worn correctly. As professionals know, this # should be reduced by “7” for a more accurate #. For example, if the manufacturer says their ear plug offer a NRR of 30, then 23 should be assumed is the actual reduction. I suggest trying several different styles & types of hearing protection until you find what you prefer. Personally, I use a quality set of muffs that are very comfortable to wear. Like many other hobby woodworkers, the noisy equipment is turned on & off often, and muffs are just easier for me to don/doff. I keep them by my dust collector controls so that I can put them on before I start my DC. After almost 20 years in the trenches doing TV production & editing, with speakers up loud so you can hear what you need to hear and banks of monitors glaring at you you don’t have much hearing or eye sight left. I don’t worry much about noise, but I do protect what’s left of my eye sight.